Blondie and Brownie: Martha was Right! 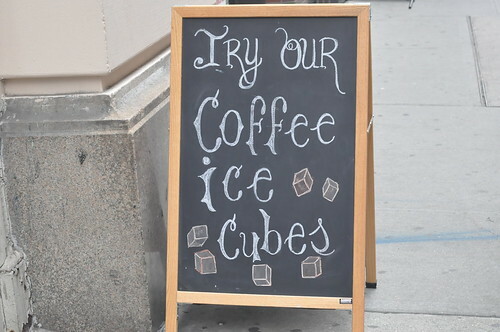 Coffee Ice Cubes are Awesome. The shop was the little Alice's Teacup outpost inside Books of Wonder, a children's bookstore right near Union Square that's one of the best bookstores in the city and easily among the best children's bookstores I've seen in the country. If you have kids or know people with kids, this is the place to shop. The staff is knowledgeable and passionate about children's books and they'll steer you in the right direction. The high ceilings, whimsical art and gallery in the back make it such a pleasant shopping experience. Annnnnnnd, I think I mentioned that they have an Alice's Teacup in the front of the store, so you can get your scone fix then do some shopping, which is exactly what I did. 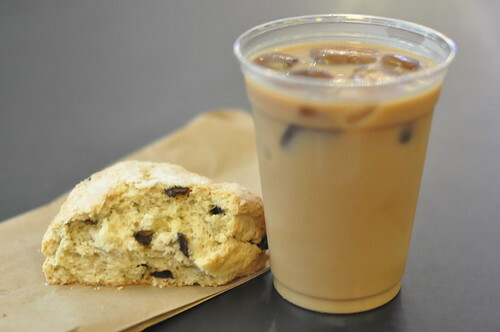 The banana chocolate chip scone was awesome. Not too dense, plenty of chocolate bits and some serious banana flavor. Regular iced coffee's cost $2, so it's an extra $1 for the ice coffee cubes, but if you drink as much iced coffee as I do (read: you think small is an awfully stupid size for iced coffee), then you'll appreciate being able to enjoy that much more actual coffee in your cup. It was good to the very last drop. I still have misgivings about dedicating the space to an extra ice cube tray at home, but at least I know where I can get my fix when the hot weather hits. Here's the trouble, as John and I see it: Sure, your coffee doesn't get watered down, but instead it gets stronger as the cubes melt (if you add milk or cream or something). Not a deal-breaker, but something to be prepared for.